“Infused with gentle optimism, eleven uncompromising stories explore, each in its own way, the nature of sacrifice. When I moved to Melbourne in 2009, I headed straight for the PC or the pen the moment I woke. Once I had completed a draft of my memoir Lovesick, a story I’d contained within myself as a matter of private reverie for two decades and then allowed to burst forth like an avalanche the moment I felt ready and brave enough to give it a voice, I turned my attention to short-story writing. 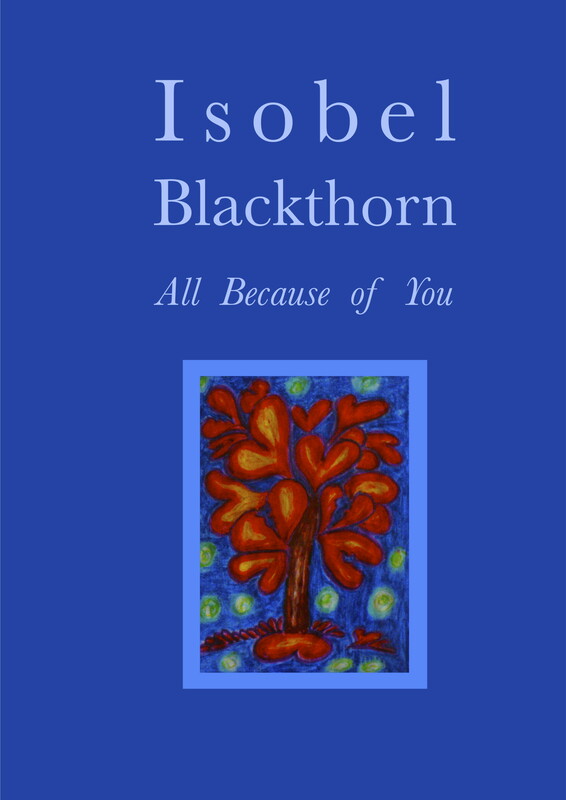 Two years on, and the result was All Because of You (Ginninderra Press, 2012 ), a collection of eight stories which depict intimately and honestly the travails and heroic responses of women and men confronting the pith of their lives. Odyssey Books re-released the collection in 2016, with an additional three stories. I smile when I read these stories. Most are based on real events. When I taught at a high school my Principal used to tell others that I’d led a ‘rich and interesting life.’ We both knew the euphemism held secret so many tales. Little did we know how many more would unfold in my life. But interesting events and experiences, which we all live through, do not necessarily make good stories. For that a huge amount of creative and editorial work must be done. Friends ask me how long a story takes to write. I try to imagine all the revisions, the readings, the puzzling over this or that sentence. Hours and hours, over weeks and months. What is the point? – Self-glorification or self-gratification. No. Writing is a compulsion. All artists seek to communicate. And all writers hope they have something worth saying, some insight or wit that will entertain and stimulate. Sometimes even cause a moment or two of reflection. Those moments make it all worthwhile. Here is a live-to-air reading of another story in the collection, Blue Skies Over Bendigo, a memoir of my great love and celebrated songwriter Alex Legg’s reflections on his gig in Bendigo on Australia Day. And here is Alex performing the song that inspired the title story, All Because of You. She’s lying in a single bed a metre from mine, all snug in flannelette pyjamas buttoned to the neck. Hers are pink. Mine are black. We’ve been sleeping side-by-side in these single beds for six weeks, imagining ourselves two girl scouts having an adventure holiday. This is no holiday. Somewhere in this city a freebooting cowboy holds a lasso above my daughters’ heads; the rope hovering, poised to drag them, arms flailing, from the protective ring of my domesticity. Not a chink of moonlight breaches the beige curtains. We’ve squashed old sheets behind the curtain rail and taped layers of newspaper to the narrow window pane above our beds. Mum can’t sleep if there’s a light chink. And the woman in the unit next door keeps her outside light switched on all night. She’s scared her boyfriend will turn up wielding an axe. Mum can’t see what difference leaving the light on makes. A snarling Rottweiler – yes. But fear knows no common sense. or Book Depository or through all good booksellers.